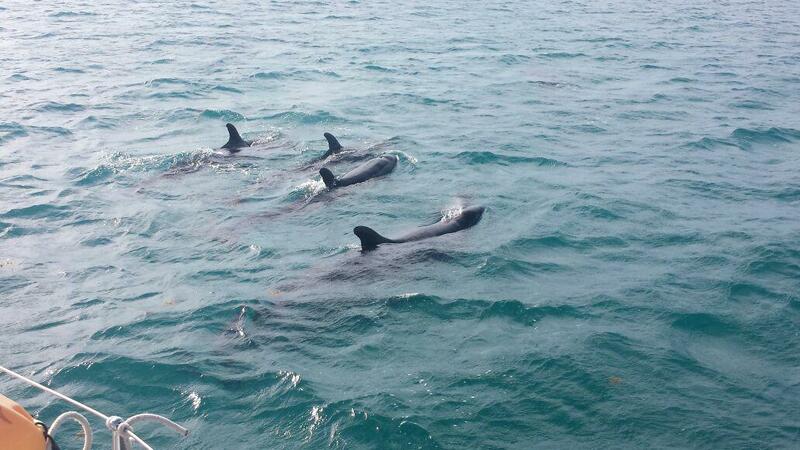 As mysteriously as they arrived, a group of approximately 32+/- false killer whales disappeared. Normally one would be excited to see whales in the wild, but the concern was that this species is known to inhabit deep oceanic waters outside the reef and it is believed that they were lost, or sick, and that they may strand, and die. There was also discussion of euthanizing the whales should they become too weak to survive. With the photographs of their dorsal fins it would be possible to identify specific individuals that may be seen elsewhere in the Caribbean, and thus confirm in fact that made it safely back to the Caribbean Sea. The pod was first observed leeward of the Drowned Cayes on February 18, about one mile southeast of Stake Bank Caye. The group then appeared February 22, residing in deeper water veins west of Forman Caye. Here they were observed moving in a circling pattern and remained for 5 days until Feb 26. On February 27 the group was observed in the Sugar Bogue channel west of Mapp's Caye, just northeast of Swallow Caye. The sighting on Feb 27 was the last time anyone observed the pod of FKW. Aerial surveys and boat surveys were conducted but they were not observed. It is hoped that the group made their way back home through the St George's Caye Channel. The Whale Sightings Belize map presents a summary of the location of confirmed observations of whales in Belize. In collaboration with the Fisheries Department, ECOMAR visited the site on Monday morning to take drone footage, observe the group, determine size and test the herding method. The activities were planned in consultation with false killer whale experts from around the globe. The Fisheries Department organized drone surveys in collaboration with Julio Maaz and Jon Ramnarace/WCS. ECOMAR facilitated transport and recruited volunteers. This footage of the FKW is when they were located between Spanish Bay and Forman Caye. 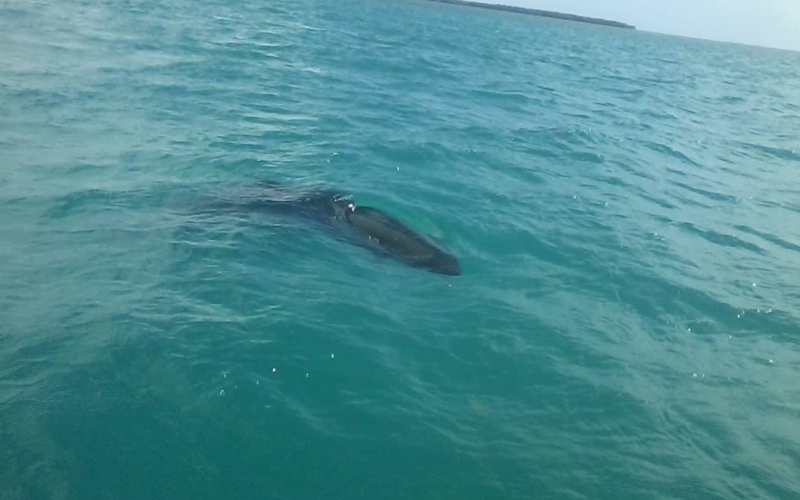 As we arrived at Forman Caye on Monday morning the whales were not in their usual spot. We looked all around and were hopeful they had left. 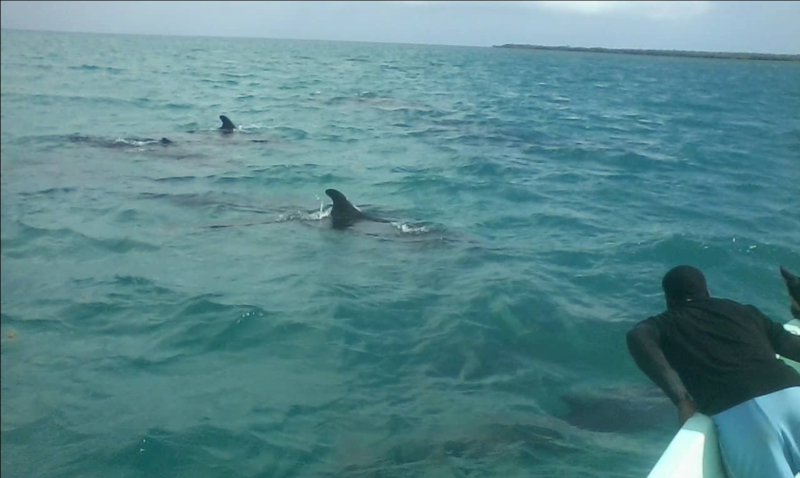 But then we circled the island and found the pod north of Forman Caye, that lead into a shallow dead end. On Feb 26 the group was in 4 groups north of Forman Caye and displayed tail slapping and in the boat we could hear them echo locating. ​We were concerned for their safety and waited for the drone to fly over so we could have the boat in the footage to estimate animal size. After much consultation with experts about herding the pod to deepers waters we tested the "Oikomi Pipe" method using scuba cylinders to see if the sound would encourage them to move from the shallow area where they were found. If anyone observe any whales, please be sure to take pictures and report!